April 1, marks the first day of fire season according to the Forest Fires Prevention Act. Although much of the province is still covered in snow, our FireRangers are beginning to return to the Fire Management Headquarters. By the beginning of May, the fire bases will have their full complement of staff back for the season. Crews will be hard at work in order to brush up on their skills through both hands-on and in-class training. This time of year is crucial for new firefighters to gain valuable knowledge and skills that will help them manage fires as part of a crew. If you are planning on burning outdoors, be sure not to start a fire until two hours before sunset and have it extinguished no later than two hours after sunrise. Always exercise caution and ensure conditions are suitable for safe burning and that you are able to properly control your fire. Outdoor fires are regulated under the Forest Fire Prevention Act so be aware of the provisions under the Act. Check with your local municipal fire department for your local burning by-laws. Look here for the rules on outdoor burning. The forecast is calling for a mix of weather across the province. Snow, freezing rain, rain and thunderstorms are possible over the next few days. Fort Frances District has had the first fire of the 2015 season. Fort Frances Fire 001 started on March 24 and was fought by the municipal fire department with support from the Aviation, Forest Fire and Emergency Services program. The fire was located in the Township of Dawson and declared out on the same day at 4.0 hectares in size. Forest fire yesterday east side of Keefer Lake..... reported out. It was extreme yesterday but since we did get a bit of rain it is now high. As of now, dry and hot weather is in the forecast. High of 29C predicted for Friday so it doesn't look good fire-wise. 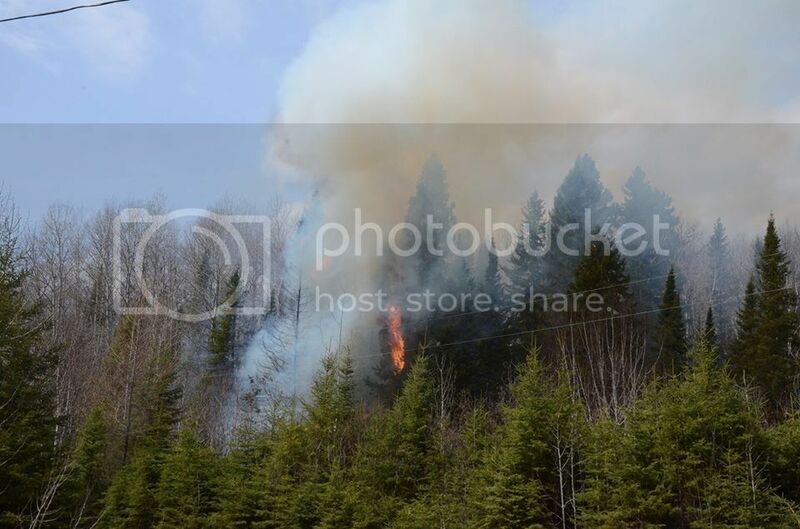 Riskynet wrote: Forest fire yesterday east side of Keefer Lake..... reported out. Glad they got it out so quickly. When is the parade? I'd expect that from John or Cap....not you Kramer. I hope "The Unicorn" is there!! Oh man, that Unicorn head kinda freaks me out. What are you? The new tT agitator? JohnW wrote: Oh man, that Unicorn head kinda freaks me out. Should hire Unicorn guy to stand outside John's window at night and freak him out. Noooo! There are already too many members here with that title! Forest fire a just Northwest of Kamiskotia Lake near Byers Lake on the edge of city limits. Timmins 6 was discovered on June 27 and is located northwest of Timmins. The fire is 5 hectares in size and is not under control. Fire crews and air attack are working to suppress the fire.